Found in "Activities, Gear, Skills and tips"
Whether you’re about to go ski touring around snowy peaks in the BC backcountry, travel through lush rainforests in Southeast Asia, or board a plane for a trip on the other side of the country, knowing how to pack efficiently is undoubtedly one of the most useful skills to have. Both James and Mark are advocates for rolling their clothes rather than folding them. The beauty of this technique is that you can easily stuff these “burrito-shaped packs” – as James calls them – inside items with empty space, like your shoes. Plus it means you can unroll your clothes without them ending up all creased. Mark points out that another advantage of rolling your clothes is that you don’t have to rummage through stacks of folded items to find a specific shirt. To make it easier to find things jumbled in your backpack, use packing cubes. James likes to separate his belongings into different categories for each packing cube: one for electronics, another for first-aid items, a third for cooking utensils and so on. Each packing cube is colour-coded and labelled for clear identification. Not only does this help you stay organized, it’s also handy in emergency situations when other people might have to sift through your bags to find something fast. Let’s say you get injured in the backcountry, and you’re unable to open your bag and grab a first aid kit. With a properly labelled packing cube, your travel buddy can find the first aid kit with ease. 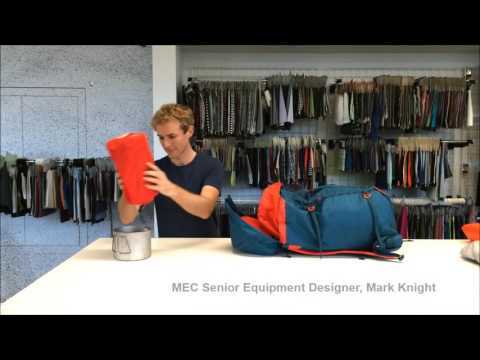 Mark uses packing cubes with two compartments to separate his clean clothes from his dirty laundry. This is a great way to help keep your fresh t-shirts away from your well-worn socks, and when you get home, you can empty the “dirty” compartment straight into the washing machine. Put a rain cover over your backpack. Besides keeping your backpack free of moisture, a rain cover will also help protect your bag from tree branches on the hiking trail. Store vulnerable items in a waterproof stuff sack and then put the sack in your backpack. This will keep your items dry, even when you need to put your bag down on wet, marshy ground. As you’re packing up from a camping trip, put the wet portion of your tent in the outer compartment of your backpack so that it’s exposed to fresh air and can dry more quickly. Consider these packing tips when prepping for your next trip. You never know how much you’ll want to bring back home, so get creative with how you squeeze in that extra souvenir t-shirt or two. Looking for more travel tips? Check out 16 rad travel hacks from adventurous Canadians. Wearer of many hats and helmets: writer, CSIA level 3 ski pro, data geek, backcountry explorer, rookie rock climber. Driven to tell stories that bring the adventurous spirit out of everyone.